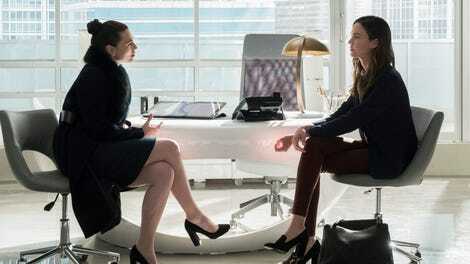 Supergirl’s third season has had its ups and downs, but so far its weaker episodes have been the ones that seemed largely designed to be filler. When it comes to its major ongoing storylines, this season has been relatively strong. Unfortunately,“Both Sides Now” is the first mythology focused episode of the season that didn’t really work for me. I can appreciate the rough sketch of what it was trying to achieve, and Krys Marshall turns in one of the show’s most interesting guest performances as Julia Freeman/Purity the Worldkiller. But a weak script can’t fully sell the emotional depth this episode is striving for. “Both Sides Now” is a Jekyll and Hyde story about the way these Worldkillers (Reign, Purity, and presumably Pestilence, although we haven’t met her yet) are torn between their human selves and their alien ones. Like Sam, musician Julia Freeman switches in and out of her Purity persona without even realizing it’s happening. So when the DEO storms Purity’s house to capture her, Julia is just innocently jamming out to Lisa Loeb. Thanks to her inherent sense of empathy, Kara picks up on what’s happening almost immediately and quickly tries to reach out to Julia. Unfortunately, Alex’s cynicism causes Purity’s deadly side to be unleashed. That Kara wants to look for the good in Julia absolutely rings true to her character. But in order to inject some conflict into the episode, writers Jessica Queller and Paula Yoo wind up making Alex feel really out of character. Sure, Alex has always been the more cynical and pragmatic Danvers sister, but her aggressiveness towards Purity feels really over-the-top, to the point where the episode even has to have Kara directly address how callous Alex is being. At first I thought Alex was being overprotective because of how badly Reign hurt Kara in the mid-season finale, but it turns out she’s actually motivated by the hopelessness she’s been feeling since her breakup with Maggie. Given that that doesn’t really track with how we’ve seen Alex act in recent episodes, “Both Sides Now” has to go out of its way to over-explain the idea multiple times in increasingly clunky speeches. The goal of the episode is clearly to juxtapose Alex the cynical solider with Kara the optimistic superhero while simultaneously juxtaposing caring human Julia with deadly killer Purity. It’s a smart concept on paper but it feels inelegant in practice. For instance, rather than feeling like a satisfying reversal, Alex’s climactic decision to reach out to Julia with empathy feels like it comes out of nowhere. It doesn’t help that we spend virtually no time with Julia herself. Though Marshall is clearly more than capable of playing both characters, Julia winds up feeling more like an idea than an actual person. So her decision to sacrifice herself to save Alex and Kara doesn’t carry as much weight as it should. Plus, personally, I feel like everyone should be far more concerned about the fact that Alex apparently lets her personal life so drastically dictate how she acts as a DEO agent. Where “Both Sides Now” does succeed is in its visual flourishes. Though this is a talk-heavy episode, it also has its fair share of impressive action sequences too, and director Jesse Warn brings a cinematic visual flair to Purity’s attacks. The opening raid on Julia’s house is a particular highlight and I love the moment in which Kara creates an ice wall to block Purity’s sonic booms and then has J’onn phase through it to handcuff her. Purity’s DEO breakout and the final subway fight are both strong action sequences as well. But while those impressive visuals would perhaps be enough to make up for the weaker writing in Alex, Kara, and Purity’s story, the episode’s so-so subplots drag it down. While helping Mon-El fix the Legion’s ship, J’onn discovers that Mon-El and Imra’s relationship isn’t as picture perfect as it seems. In a Martian moonshine-fueled heart-to-heart, Mon-El reveals that his marriage to Imra began as a political arrangement designed to unite disparate planets. He eventually came to love his wife, but never quite in the same way he loved Kara. So being around Kara again has dredged up conflicting emotions he doesn’t know how to process. Though the writing is once again really clunky, I like that J’onn advises Mon-El to share his feelings with Imra and that Imra takes Mon-El’s confession as well as she does. And in a nuanced character drama, there would be a lot of compelling stuff to mine from watching mature characters openly and honestly explore the complexities of love and loss. But Supergirl is never going to be a show that functions first and foremost as a character drama, which means this subplot just feels like our first step on the road to getting Mon-El and Kara back together rather than something interesting in its own right. Elsewhere, we get our umpteenth retread of a plot in which Sam suddenly disappears, leaving Ruby behind. It’s not a bad storyline in and of itself (and I like the detail that Ruby calls Lena when she needs help), but we’ve seen this sort of thing way too many times this season. It’s a relief when Lena reveals she’s figured out that Sam’s blackouts and Reigns attacks always occur at the same time (at least I assume that’s what she’s figured out), but it feels like something that should’ve happened a few episodes ago. 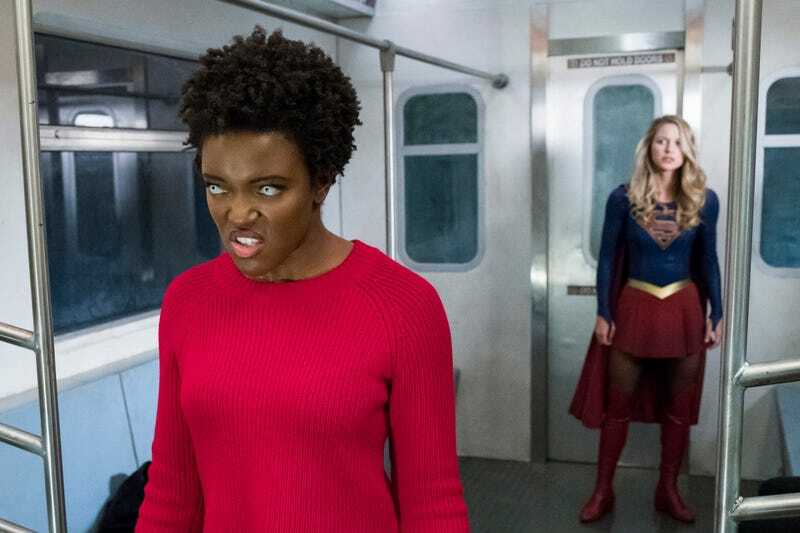 It doesn’t help that “Both Sides Now” is our last new episode of Supergirl for the next nine weeks and thus has to function as another mid-season finale for the series. As such, we get a few minor cliffhangers to contemplate over the hiatus: Lena has a plan for helping Sam; Imra has a secret to tell Mon-El; and Kara has a new goal of trying to save the Worldkillers rather than defeating them. Those aren’t uninteresting threads to pick back up when the show returns April 16th, I just wish this episode had found a more compelling way to introduce them. Is this the first episode that hasn’t opened with the “My name is Kara Zor-El” monologue? David Harewood’s American accent is so flawless that I almost always forget he’s actually British. Unfortunately, the phrase “anti-gravitational” proved to be his downfall tonight. Speaking of Harewood, J’onn has felt way too removed from the Danvers sisters this season. The show has never made a big point of emphasizing the Alex/Winn friendship, but Chyler Leigh and Jeremy Jordan have developed a great friendship chemistry over the years to the point where their hug tonight feels incredibly earned.